Early into the US occupation of Afghanistan, a photo of soldiers was widely circulated in which a pair of camel spiders hung grotesquely in the foreground. For a week or two everyone shuddered at the thought of those humongous Middle-Eastern spiders, and then we collectively forgot about the whole thing. Inevitably, Roger Corman produced the movie “Camel Spiders”. The only real surprise was that it took almost a decade for him to get around to it. That green is nature’s way of warning viewers to avoid the film. The film opens during a firefight in Afghanistan. American troops are pinned down by rebels (extras in street clothes, some of whom are literally wearing towels), who are likely meant to be Taliban forces. In a way, it doesn’t matter. Partly this is because they’re all about to die horribly, but mostly it’s because they are irrelevant to the plot. What is relevant to — and indeed is — the plot, is how these Afghanis die. Pale spiders, about the size of cats, crawl over the combatants and fang them to death. They then drag away two of the bodies before the American troops eventually notice the lack of returned fire and investigate. The medic determines that it was death by beshbesh — camel spider. These are deadly desert spiders that can outrun men and inject a powerful venom with their bite1. Captain Sturges (Brian Krouse, of “Sleepwalkers” and the TV series “Charmed”) is more concerned about his own side’s single casualty. Corporal Plot-Device has been killed in the bullet exchange, and the lightly wounded captain assumes responsibility for taking his body home. Despite ample photographic evidence of the stately manner in which the bodies of our soldiers are transported, the corporal is crated up with a few rodent-sized camel spiders and shipped to a military base in Arizona, where it’s put on a truck transporting munitions. The driver of the truck is Sergeant Underwood (Melissa Brasselle2), and the clumsy sexual tension between her and Captain Sturges will be an uncomfortable feature of the rest of the film. Fortunately, it’s broken for the time being by an accident. The local sheriff (C. Thomas Howell) is in hot pursuit of some guy. I didn’t write his name down because, like so many characters in this movie, his only purpose is to cause trouble through his demise. Seconds after his introduction, this presumably naughty person runs into the sergeant’s truck. Our speeding driver either dies or is carted off to a hospital. His impact on the plot done, he is quickly discarded. The truck is damaged, which ensures that the captain and sergeant have to stick around. The corporal’s coffin falls out of the truck, introducing camel spiders into the Arizona wilds3. The truck can still move a bit, so the sheriff guides our nascent couple to a motel. Captain Sturges calls the base and arranges for a pick-up the next morning. Then he and the sheriff head to a diner, leaving the sergeant to guard the semi-broken vehicle with its corpse and munitions. The diner is filled with characters, and from the attention given them it is clear that they are to become the primary group of survivors and victims for the remainder of the film. There’s the bickering couple with a distanced teenager; the owners of the diner; a pair of investors, who want to tear town the diner and build a casino; the waitress a heart of gold; and two guys so into their own jaded skepticism I can only assume their journey to Las Vegas is ironic. There’s also the minority chef, whose death signals the arrival of the camel spiders. 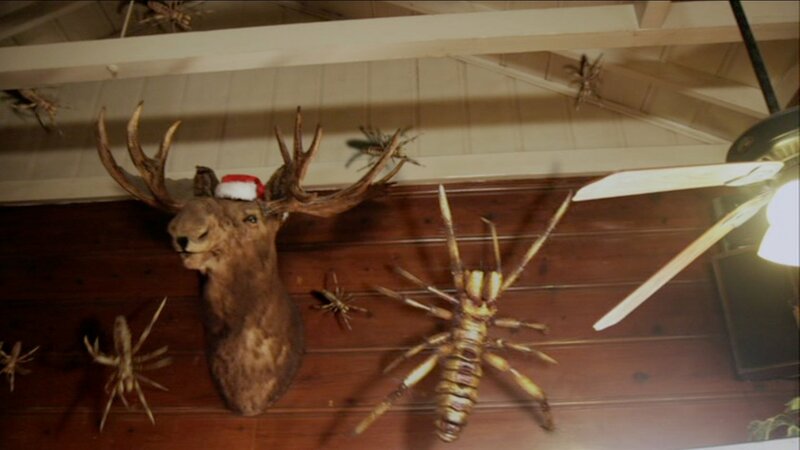 Santa Moose and his eight camel spiders come for the naughty children. There are two other groups of people who appear early in the film. Their paths never intersect that of the main characters. In fact, this isolation is so complete I suspect that at least one of these sections was added after principal shooting stopped. Given that the movie only clocks in at 79 minutes, I’m almost certain of it. It would be wrong to call “Camel Spiders” cheap; it’s budget-conscious. Over decades of working for Corman, Wynorski has learned how to spend effectively. The sound and image are clear, because it pays to spend on recording. It doesn’t pay off as much to costume extras that only have a few minutes of screen time. He skimped on the Afghani rebels, and I honestly didn’t even notice that the first time I saw it. Characters are left as broad, archetypal strokes. Any investment in them comes from our associations with the familiar roles. A remark now and then reminds us where they all are on their usual path to redemption or spider chow. Likewise, the CGI effects are mediocre at best. The spiders aren’t convincing, and they often fail to interact with the environment. Blood sprayed frequently but unrealistically. You’d think that here is where the money should be spent, to make the central menace believable. I’d think so too, really. I’m inclined to believe that Jim Wynorski agreed. It’s likely that with the volume of effects this was as good as could be provided by the budget. Given the choice of quantity over quality, well… this is a Roger Corman production. The large number of spiders is a pretty good trade for quality. The demands on the actors and script are significantly reduced by the frequency of spider appearances. There’s some screaming, a lot of running, then a pause to drop some clumsy character beats — that’s the basic pulse of the movie. The rhythm never becomes frantic, but it’s active and never let’s the movie lose you entirely. In fact, it’s a lot of fun without being any good at all. A case in point is what I call Chekov’s spider4, a spider shown in the first act that comes into play before the end of the movie. This is as close as the movie comes to a real payoff for paying attention. Shortly after the coffin falls out of the truck, a camel spider crawls into a car through its open sun roof. Almost immediately, someone takes the car to go get help but arrives safely. The spider, apparently, is napping. Much later on, long after the audience has given up on that particular plot point, someone else sticks his head in the car window and gets a face-full of spider. The delay is almost clever, and as such it sticks out in a movie that asks so very little of its audience. Give “Camel Spiders” a minimal amount of your attention, and in return it will give you all it’s got. As little as it has, that’s a pretty even trade. In fact, camel spiders are not “true spiders”. They’re related arachnids belonging to the order Solifugae. 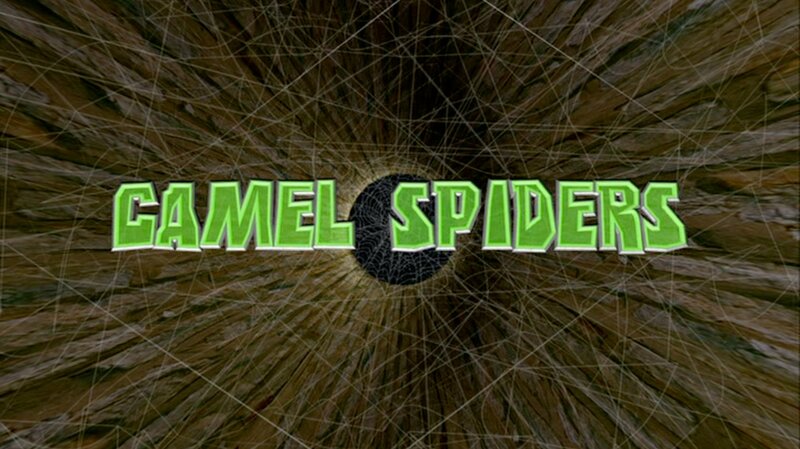 The movie alludes to this with the constant refrain of “It’s only got six legs!” In fact, camel spiders have eight legs. Two camel spiders hitch a ride with the corporal’s body. However many there were by the time of the car accident (whereupon every last one fled for the desert), they all had to fit in the coffin. A few hours later, there were dozens of them at the diner. By the following morning, hundreds swarmed the abandoned facility, and some were the size of a person! These are breeding and growth rates that don’t just defy reason — they walk up to reason, break its cane, take its wallet, and give it a good kick before running away laughing down the street. Why do the experts always walk right up to get bitten? Don’t they cover that in the introductory classes? There’s a locked door in the gypsum plant. We never find out what’s behind it, and it’s sort of driving me nuts. 1. Camel spiders are non-venomous, grow to about 6″ max, and top out at about 10 mph. 2. Melissa Brasselle is not only a Corman regular but has worked almost exclusively with Jim Wynorski. Out of a few dozen appearances, no fewer than 17 have been in his films. 3. While this particularly fictional breed of camel spider is indigenous only to the Bronson Canyon region of Afghanistan, real camel spiders are present throughout the world in sandy environments. 4. Yeah. I referenced Anton Chekov in the review of a crap spider movie.